Are you one of those people that have all the credentials on paper but when it comes to getting a job in a big company you can never seem to make the cut? It is even more disheartening when you hear that someone who is intellectually less capable than you manages to get selected. In this day and age where no one has the time to have a long drawn out interview over a meal or even face to face, the resume that you forward a company is a representation of you. Just as top companies spend big bucks advertising their products, similarly a resume is nothing but a powerful marketing tool that is the first step in convincing a company that they need someone exactly like you working for them. Here are some things you can do or mistakes you can make that will instantly get your resume rejected or thrown straight into the trash. It is quite natural that the first thing noticed about your resume is the file name. At times there are innumerable people out there who attempt to be creative at this stage and think that they are creating a good impression by naming the file something naïve like, ‘The best resume’ or “Career Profile”. Doing something like this merely displays that you do not even know how to write a resume so hiring you would not be an asset to the company in any way. The name of the file should always be your own name printed in capital letters. So if your name is Joan Lou, then you are to simply name your file, JOAN LOU. Recruiters do not appreciate it when you write you name as Jo@n Lou or even Joan_Lou. Many a time people encourage us to think out of the box, however in situations like this it is better to keep it simple and stick to the basics so as to avoid disqualification without the recruiter having even read your resume. In this technological world one of the most common modes of communication is via email. At the end of your resume you should always mention your contact details so if you are short listed the company can get in touch with you instantly. Therefore when mentioning your email address make sure that it is something professional and mature. Using the email id which you made when you were in middle school isn’t going to make a good impression. Creating a new email id is free and hardly takes any time at all, so if you notice that it is something inappropriate you immediately make a new one so that the company knows that you are someone means business. Writing a resume could prove to be a challenging task for some but you should make sure that you put your best foot forward and make for yourself a unique and appealing resume which states coherently and comprehensively all you educational qualifications as well as accomplishments. Try as best as you can to think of any achievements, especially those that could help you get the job that you want. If you are applying for a content writing job then you need not mention a cookery contest that you won in middle school. It is important to sift out unnecessary details as no one has the time to read a very long resume, but having mentioned that you should also make sure that you are not writing your accomplishments too briefly such that it seems like you do not have many achievements at all. A chief characteristic of a good resume is that it should be comprehensive, articulate and to the point. While preparing your resume you should remember that this isn’t an essay writing contest so you should try your best to be precise. In an attempt to impress the company hiring you should not mention too many vague or abstract qualities like “I am an interesting, honest, bold and hardworking woman”. Lines like this mean absolutely nothing to the recruiters as this is just your opinion of yourself and there is no validation for it. Many individuals try too hard to impress recruiters through their resume. Writing a resume does not mean that you have to use high sounding words to give the impression that you are extremely erudite. A simple resume is often much more appreciated as the person hiring can simply browse through all the details at one go without stumbling upon all the big words. Experienced recruiters can tell at once when someone is trying to sound smarter than he or she really is. So if you are preparing your resume you do not shy away from being yourself and using your own words. Your resume is a reflection of you. If your prepare a disorganized and haphazard resume then the recruiter naturally draws an inference that you too are a disorganized and callous person who could not care less about work that is submitted. The best way that you could prepare your resume is by going about according to particular subtitles. First you should begin by giving you name, followed by educational qualifications, accomplishments, extracurricular activities, talents and then contact details where you mention your address, mobile number, landline number and then email address. By going about preparing your resume in this manner you can never go wrong. It does not take a very experienced eye to know whether a resume was prepared with care or whether it was the product of a person sitting twenty five minutes at his laptop. When a resume is prepared in a rush there are invariably some spelling errors or grammatical mistakes that your spell check might have not picked up on. If you would like to be hired by a company it is up to you to set aside sometime from your busy schedule to make sure that you make a powerful impact on the recruiter. If you prepare a dull resume that lacks any luster at all then do you seriously expect to hear from a high end company? One of the biggest mistakes that anyone applying for a job could make is using one of those free online apps that instantly make a resume for you when you put in your details. An online app could never do justice to all that you have accomplished so far in your life. No one can prepare a better resume for yourself than you. It is all right to seek assistance from a trusted friend or college professor but every word in your resume should be exclusively your own. If you do not want to invest your own time in preparing a good resume for yourself then why should a company invest its time as well as money in someone like you? A well prepared resume silently communicates to the recruiters that you are a hardworking person who believes in himself or herself and you rely at all times on your own capabilities. A big mistake that most people make while applying for a job is making use of the resume that they had prepared straight after they had graduated from college. The only effort they make is to occasional update details as and when required. But doing something like this hardly ever works as the person you are now is almost entirely different from the person you once were when you had freshly graduated from college. A recruiter or in fact anyone who is reading your resume will easily be able to detect the discrepancy between the part that was written by you five years ago and the part updated by you recently. No company will be willing to hire an individual as lazy as this so they are sure to toss your resume straight into the trash. It is no surprise that everyone exaggerates just a little on their resume. However it is not acceptable to write blatant lies just so that you can come across as being an achiever. What many people do not know is that very often the companies cross examines many of the details that have been provided on the resume. For example saying you quit your previous job when you actually got fired is not a very clever move as recruiters can easily get in touch with your previous place of work. So telling a great deal of lies will not only lead to an embarrassing situation but it will surely get your resume disqualified immediately. 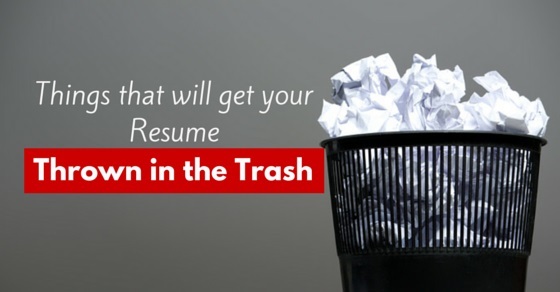 These are some of the chief mistakes that you can make which will certainly get your resume tossed into the trash. Preparing an impressive resume does not take a lot of time nor does it entail much money so you should give your 100% while preparing it, as in the long run the only one to benefit from it will be you. Previous articleWhy you Should work for a Startup Company?